This female empowerment story with an extraordinary international cast and a clunky title had a bumpy path to the screen. Originally, (Irish actor) Michael Fassbender was to star opposite (Israeli-born) Natalie Portman, but he left early on due to either (a) clashes with original (Scottish) director Lynne Ramsay, or (b) scheduling conflicts with an X-Men movie, depending on which version one believes. (Australian actor) Joel Edgerton was moved from playing the villain to the role opposite Portman, and (English actor) Jude Law signed up to be the villain, only to leave shortly after Ramsay’s departure as director just as shooting was to start. Bradley Cooper was then to come in as the bad guy, but also had scheduling conflicts. 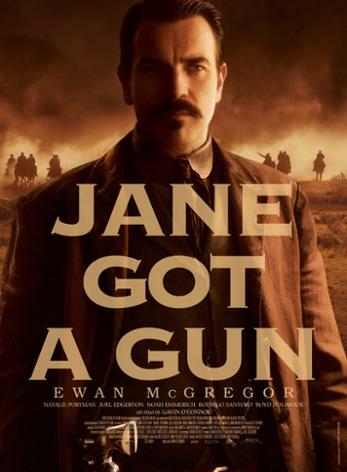 Finally, (Scottish actor) Ewan McGregor was signed, Gavin O’Connor (director of the underrated Warrior) came in on very short notice, and the film was shot in New Mexico in early 2013. Then it languished on the shelf for almost three years, while its distributor went into bankruptcy. Eventually, the movie came to the Weinsteins and then to the big screen in early 2016. Such turmoil in production often leads to very lowered expectations for the product. It shouldn’t, in this case. 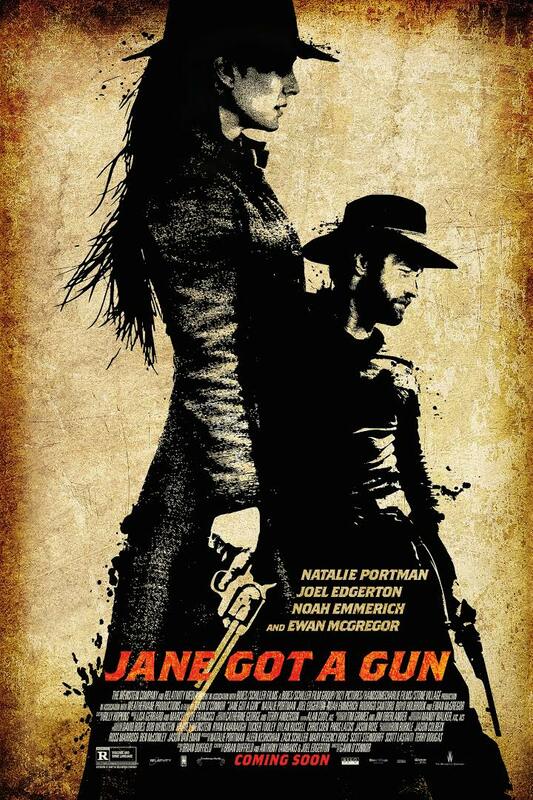 Jane (Natalie Portman) seeks help from former flame Dan Frost (Joel Edgerton). 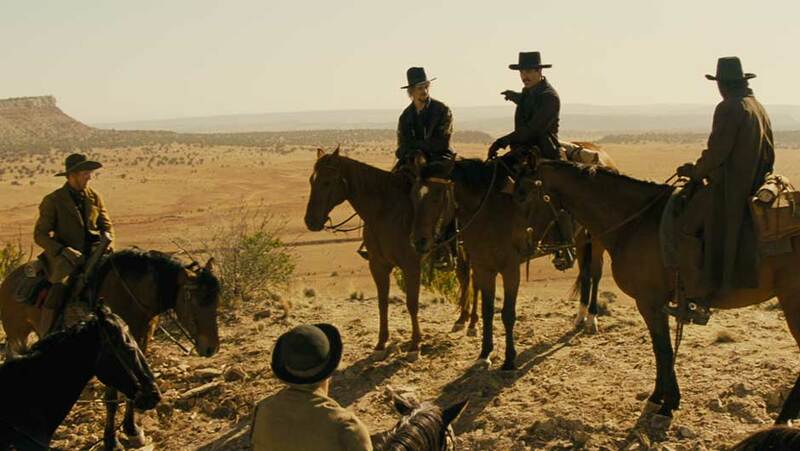 In New Mexico Territory in 1871, Bill Hammond (character actor Noah Emmerich) rides up to the remote ranch he shares with his wife Jane Ballard Hammond (Natalie Portman) and young daughter, only to fall off his horse with five bullets in him. He mutters something about the Bishop Boys coming. After providing some doctoring to Hammond, Jane takes her (three-year-old?) daughter Kate to a neighbor for safety. 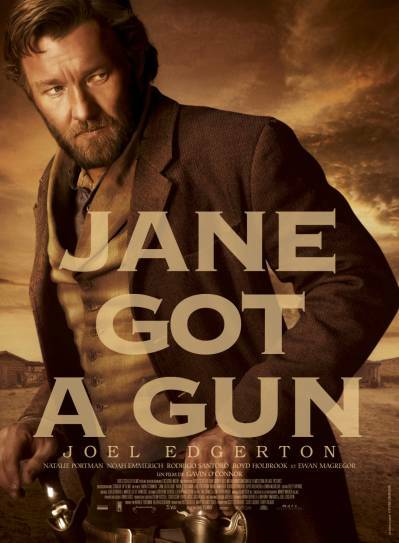 And then she seeks out Dan Frost (Joel Edgerton). Much of the rest of the story is told in various flashbacks. Frost and Jane had been lovers in Missouri before Frost left to fight for the Union early in the Civil War, ten years previously. He was apparently some kind of hero in that conflict and now has some talents as a gunslinger, which is what Jane says she’s seeking. 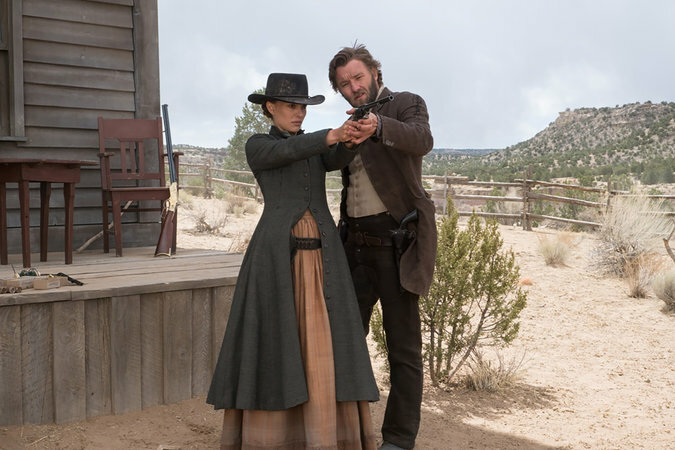 In another flashback, we see that in 1866 Jane, believing Frost had been killed in the war, took her daughter Mary and joined a wagon train of women heading west under the leadership of John Bishop (Ewan McGregor). Meanwhile, Frost had also come west in search of her and had eventually ended up asking Bishop, who was also looking for her by the time Frost came to him. 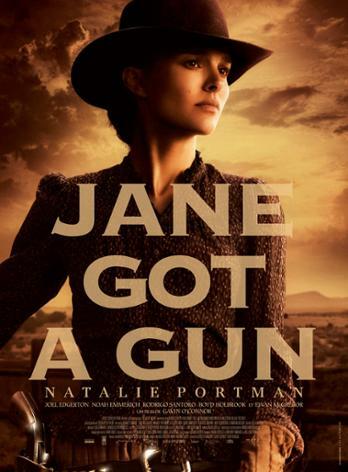 Jane (Natalie Portman) is not a natural with a pistol, although she can handle a rifle. [Spoilers follow.] Finally finding Jane married and with a child, Frost has apparently taken to drink and bitterness. However, he reluctantly comes to Jane’s aid when she is attacked in town by one of Bishop’s men. At the ranch Frost directs the effort in putting together a makeshift mine field in front of the cabin with mason jars, kerosene, nails and glass shards. In more flashbacks, we see that Hammond was one of Bishop’s men. He fell in love with Jane and rescued her from a brothel in Raphael, New Mexico, which is where the nefarious Bishop planned to take the women all along. Jane’s daughter Mary had apparently been drowned, and current daughter Kate was conceived as a result of her brief stay in the brothel. Another Bishop man shows up at the ranch, and Frost dispatches him. The principal Bishop attack comes at night, with an incredible barrage of bullets shredding the ranch house. However, the mine field works spectacularly, and the odds against Jane and Frost are reduced. Both Frost (right shoulder) and Jane (torso) are hit, and Hammond is finished off, although he was apparently dying anyway. Frost gets the last few attackers, but the final one is Bishop himself, who captures Frost. Jane gets the drop on Bishop, and he claims that Mary is still alive. As Jane blasts him, Bishop reveals that Mary is at the brothel in Raphael. The makeshift mine field takes its toll on the attackers. In the final scenes, Jane and Frost retrieve Mary, and Jane claims the rewards for the now-deceased members of the Bishop gang (including $5000 for Bishop himself). She forgoes the $2000 reward on Bill Hammond. With the proceeds, she, Frost (with arm in a sling) and their two daughters head for a new life in California. The actors are excellent. Portman, Edgerton and McGregor all appeared in earlier Star Wars movies together and are unusually capable. One of Edgerton’s major roles a few years ago was in the very good Warrior, directed by Gavin O’Connor. Here, Portman gets a producing credit, along with several others, and was the moving force behind it all. Edgerton has a writing credit, as one of three. McGregor doesn’t actually show up on camera that frequently, but he is snakily evil when he does, and his menace looms over the entire movie. The film has some grittiness; it is rated R for graphic violence, brothel scenes, loathsome bad guys and some bad language. But if you can stomach that, it’s not a bad western. Jane’s costume design is unusually good, managing to look both 19th-century, attractive and utilitarian together—especially her hat, which looks good but is less authentic. Women’s hats can be a problem in westerns (but see Linda Darnell in Two Flags West from 1950), although they would seemingly be a necessity for any woman who spent much time out-of-doors. So what doesn’t work? There is some excellent cinematography by Mandy Walker (the young lovers in a field of cattails, for example, and the explosion of the minefield). But much of the night attack can be hard to see in the dark. Although it’s not a long movie at 98 minutes, the story is lacking a spark of something. Frost apparently did something extraordinary during the late war, but that isn’t established very well, nor is his status or skill as a gunslinger. (Use of that term by Jane seems anachronistic.) A couple of small scenes could have remedied that. Perhaps the worry was that making the Dan Frost character a bit stronger would take away from focusing on Jane’s strength. That doesn’t need to be the case, however; it can be a very good thing to have two strong characters to play off each other. The storytelling is not entirely smooth, and things seem to bog down slightly from time to time as we wait for the next attack or flashback. The inspiration for the title was apparently the 1989 Aerosmith song “Janie’s Got a Gun,” which plays on outrage for mistreatment of women and the helpless. A better title would have let this story stand on its own, even though those themes are present here, too. Movies with an overt ideological bent often do not thrive as stories; that’s why most revisionist westerns are not that good as westerns. But this one mostly works. Capable women with guns in westerns go back more than 70 years, at least to Loretta Young saving Gary Cooper in Along Came Jones (1945). Strong, vengeful women with guns go back at least 45 years to 1971’s Hannie Caulder, with Raquel Welch, through Bad Girls (1994) and a number of others, and this fits into that genealogy. The Bishop Boys, led by John Bishop (Ewan McGregor), get their orders. This is also one of those movies in which young lovers are separated by the Civil War and afterward have to sort out the consequences—or are unable to do so. See The Last Sunset, for example, and Cold Mountain. More recently, see Forsaken, which is slightly better than this film. This entry was posted in Westerns Worth Watching and tagged Manhunts on May 11, 2016 by Nicholas Chennault.